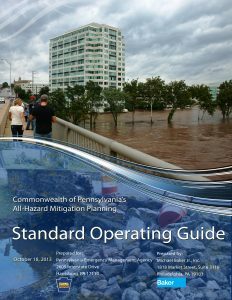 The Standard Operating Guide (SOG) documents standard operating procedures for hazard mitigation planning in Pennsylvania by capturing FEMA requirements, clarifying and combining existing guidance (particularly FEMA 386), and allowing communities a greater opportunity to excel in the preparation of hazard mitigation plans. The step-by-step “how-to” guidance provided in the SOG makes the hazard mitigation development process more manageable while creating consistency among local hazard mitigation plans. Key standards developed for and included in the SOG are: Model Plan Outline, Risk Factor Methodology, Standard List of Hazards, and Mitigation Action Evaluation Methodology. The guidance provided in the SOG allows PEMA to conduct a more thorough and detailed plan review in less time. Click here or on the image to the left to download the 2013 SOG. As a component of the 2018 State HMP Update process, the SOG will also be updated. Please continue to visit www.pahmp.com for more information about the updated SOG.